Are you too tired to even sleep? Do you lack the energy to live the life and be in the body you want? Get nutritionally dense FREE healthful tips & recipes that are both easy and delicious! 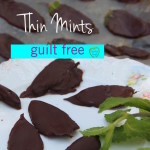 You like the classic Girl Scout Cookie Thin Mints but you don’t like feeling guilty about it? This two ingredient treat is a great-tasting-easy-to-make healthy alternative. 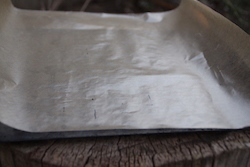 Line a baking sheet with parchment paper and place in freezer. Pluck mint leaves off their stalks, leaving a small stem for dipping. Over a double broiler (or a heatproof glass over a saucepan of boiling water), slowly melt chocolate until smooth, stirring often. I like either Dagoba or Divine brand. You could also try milk chocolate. However, I like my mints dipped in dark chocolate. Remove tray from freezer. 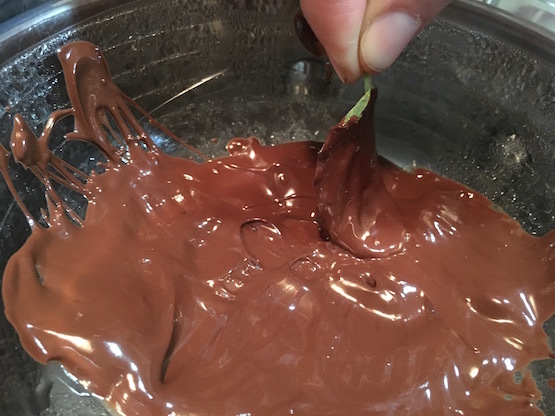 Dip each mint leaf into the chocolate making sure to coat fully. 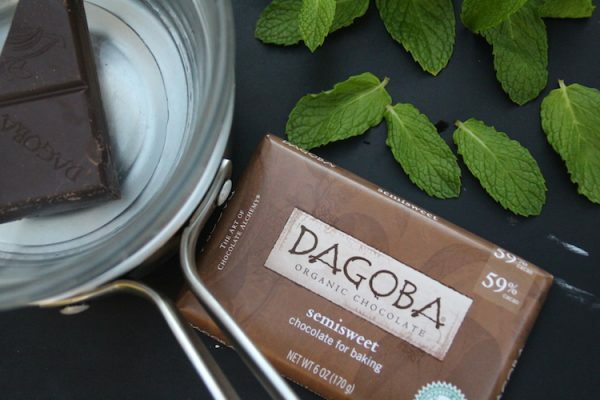 If you want your mints to be coated thinly, make sure that your chocolate is melted enough and easily coats each mint leaf. 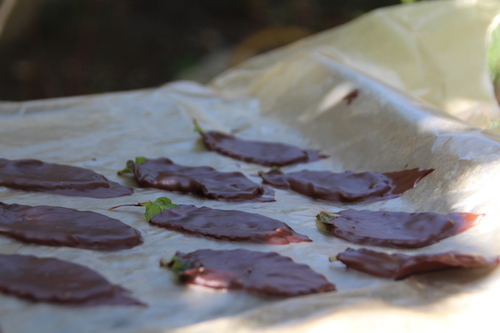 Allow chocolate leaves to harden on the parchment paper on the baking sheet. I like to place them in the freezer for a couple of minutes before transfering them to the refrigerator. If you like a light layer of chocolate, make sure your chocolate is melted to high heat. If you like a thicker layer of chocolate covering your mints, heat your chocolate to a medium heat. I'd love to hear how you made your. 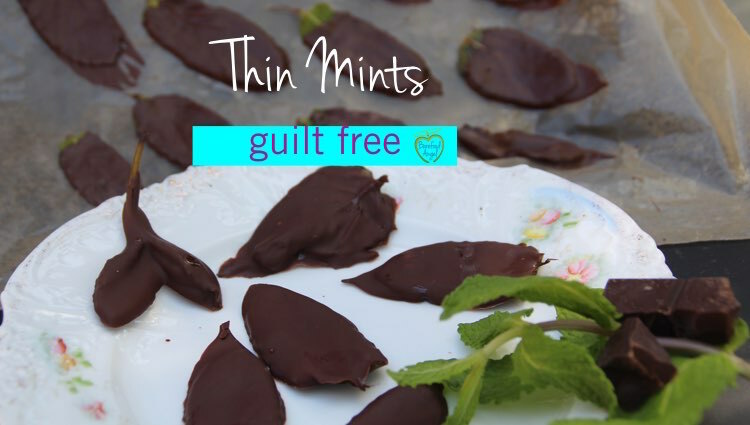 Did you make your Thin Mints layered in chocolate thinly or thickly? Leave your feedback below. Leave your thoughts and ideas directly in the comment section below. Remember, share as much detail as possible in your reply. Your comments may provide insight and inspiration and your experience may help someone else have a meaningful breakthrough. Links to other posts, videos, etc. will be deleted as they come across as spammy. Thank you as always, for watching, sharing and allowing me to be a part of your world. It’s a true honor. Feel free to share this post. Ask your friends and family to sign up through this link to automatically receive my latest posts/recipes/practical healthful ideas. I would really appreciate it if you could share this post socially. If you hover over the main image (the very top image), it will show you the social sites to choose from. Click on any of the social site buttons and share. Want to know centenarian’s secret to longevity and vitality, ease in mobility, health and vibrance? It’s not just their diet but where they sourced their food. How would you like to source food like a Centenarian without moving to a Blue Zone so you can start looking and feeling your best and enjoying life? All BareFood recipes are Corn Free, Soy Free, Wheat Free, Pork Free, Agave Free, Refined Sugar Free, Peanut Free, GMO Free, & Gluten Free. Promoting only organic ingredients, pastured raised/grass-fed/grass-finished meat and poultry, pasture raised organic dairy and eggs, healthy unrefined fats/oils. Is Juicing Right for You? Is Hemp Oil Beneficial for You? WHICH FATS TO EAT & WHICH FATS TO DITCH!